The very first page of Shuri's first solo series accomplishes something remarkable. 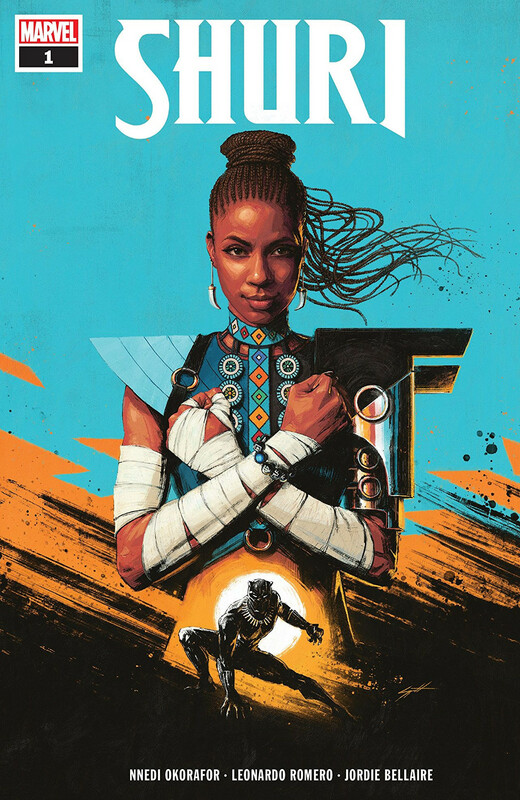 Assuming that its readers know Shuri mainly from the Black Panther and Infinity War films, it fills in the yawning continuity gap between MCU Shuri and 616 Shuri. This is accomplished - and done well! - with just four adroit panels and five succinct captions. Unfortunately, it's an achievement that kind of gets tossed overboard after the title page. The remainder of the issue does a slower and more thorough - but also more ambiguous and less satisfying - job of movie vs. comic reconciliation. The composite Shuri that emerges by the final page is an impressive and promising creation. She demonstrates considerable super-science chops and also gets good use out of the Djalia powers she picked up in the previous Black Panther volume. Her brother is currently Lost In Space, and the situation comes with an added frisson of guilt for Shuri: T'Challa blasted off (along with Manifold, whom Shuri's crushing on) in a shuttle of her own design. Once two weeks pass, she'd like nothing better than to dive into full-time rescue operations. But Ramonda and the women of Wakanda have a different priority in mind: The realm needs a Black Panther. Will Shuri take up the mantle again? And that, abruptly, is where the first issue leaves us. I don't want to undervalue the time and space devoted to getting to know Shuri, but this issue just does not deliver a lot of plot progress. I wouldn't dare claim that nothing happens in this issue, though. It feels gravid with foreshadowing. We have a mystery character, a romantic entanglement, and lots of killer new super-science gadgetry to look forward to. In terms of tone, I believe Shuri's story is at its best when it's Shuri's story. The front of the book works wonders with the pride Shuri takes in her own inventiveness. The character's glee soaks all the way through the words and wriggles its way into the reader's heart. In contrast, the language grows stilted and over-formal at the end when conversations turn to statecraft. It feels like a dutiful but unenthusiastic imitation of Ta-Nehisi Coates's last Black Panther volume. If this Shuri is to be torn between being a super-science hero or being a political figurehead for Wakanda, I already know which camp I fall in. Bring on the gadgets, I say! The visuals are a little spare, but they shoulder a lot of the storytelling burden. They rise admirably, for instance, to the challenge of explaining that Djalia-enhanced Shuri can turn into one or several birds. The script entrusts the art to handle that surprise all by itself. It's a job done well, but it also signals the high level of attentiveness this comic demands from its readers. Colours are vibrant throughout, and a flashback to Shuri and T'Challa's childhood is rendered especially memorable thanks to a fiery two-colour palette. That scene also benefits from some especially inventive layout work. I know this is going to be a slow-burn-type story, but it rankles to see something as momentous as Wakanda's first manned space launch (in a rocket of the protagonist's design) nearly consigned to off-panel limbo.